Four years out with the Lap-Band and I remember the day I hit the 100-pound club and got my pin. I went from a size 28W to a 14! Who would have dreamed that I would have had the nerve to do it! Much less to have joined Southern Surgical a year later to work in Bariatrics everyday. My journey has changed my life, health and future. The 6th of June 2007 started with the famous Southern Surgical Educational Class. August 6, 2007 was the first day of the rest of my life, my surgery day. The next two weeks was a mental battle of the reality of being addicted to food! Alcoholics should stay away from the ABC store, smokers can take smoking cessation aids, drug addicts can go to rehab, but food is required to live. Food is no different than any other addiction. Healthy food choices keep you healthy and poor food choices lead to morbid obesity. In 2007 is when I finally saw myself…Morbidly Obese at a BMI of 46. I truly hate the words Morbidly Obese!!! If you know me, then you know cake icing is my demon! This is BAD, VERY BAD! Wendy’s chili is my favorite fast food item (small, 200 calories, 17g protein at $1.29= cheap date) and I eat a lot of broiled seafood. I am the condiment queen and battle drinking while eating everyday. I have always battled my weight and I clearly understand that I will always have to focus on my food choices and my weight. Bariatric surgery was the first step and a tool to help me with my daily challenges with food. My head is still the main obstacle of the battle of my food addiction. I wish Southern Surgical had brain surgeons. Gastric Banding requires maintenance and is a slower weight loss journey. This part of the journey has worked for me. I needed the accountability of the Southern Surgical staff and the slower weight loss has allowed me to keep my head in the game of all the physical changes. I still have weight to lose to reach my personal goal and yes I have battled the few pounds up and down. This scares me because I am awesome at losing 10 and gaining 20 pounds! I also understand this is a forever part of my life. The Southern Surgical Support Group has helped me connect with others in my same world of Bariatrics. I believe we are here to help one another and to share our journeys. I would like to thank Southern Surgical and all the other patients that have touched my life. August 19, 2013 Conversion from Band to Sleeve. 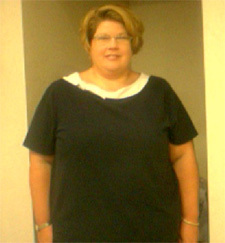 When joining the bariatric world in June of 2007 I never dreamed how it would change my life. 301 pounds, class June 2007, surgery August 2007 and the first day of the rest of my life had launched. April 2008 I found myself back in surgery with a revision of my band. I just remember begging the doctor not to take my band because I had never lost weight like this and kept it off. I was terrified of life without the tool to help control my weakness of food. I never felt weight loss surgery was the only answer to the struggles and demons of what food means to me. I completely understand it is a head game for me and a pleasure that makes the worries of the world just vanish. I am my own worst enemy when it came to my weight. I have never felt my weight made who I was, what I could do, or how people perceived me. I have always been full of life, a hard worker, raised by an incredible family, and I value the people in my life no matter the season of the relationship. Life’s journey is very different for everyone. Mine has been a mixture of all the loves of my life: family, people, helping others, working on making a difference in a world that is very selfish. Southern Surgical has given me the opportunity to be a part of each patient’s journey of the most incredible change in their life. Transforming from the old self into a new world. Now being a part of the Southern Surgical bariatric world as an employee I felt the spotlight was on me to succeed with my weight struggles. Well I have found that to be an impossible task. Especially when people have different goals and dreams. The thoughts of others cannot control or direct what is best for me. My best is to be healthy, control my weight at a personal and comfortable place which for me I really love being the size 12/14 which is about 175 pounds for me. For others that is still obese and they would want to continue to loose. I have always battled my weight and being a big girl has just been a part of my life. I really liked her and still do! In 2011 I truly started struggling with tightness of my band: nausea, weight gain, changing my food intake to sliders and liquids so food would go down. Coming to the office for adjustments looking for relief. But even if I got it down that didn’t mean it was going to stay down. I was miserable! Sleeping sitting up and scared of the weight gain. The doctors ran test, tried everything they knew to due with no relief. In February 2013 the battle with the insurance company began. It was tiring and at times I just felt defeated, it took six LONG months, with several denials before I finally was approved for the conversion to Sleeve from Banding. I am so grateful to the staff at Southern Surgical and the patients that I call friends that stuck with me all the way! August 19, 2013 was the next stepping-stone in my life journey. I woke from surgery with no reflux, no tightness in my chest and truly very little to no pain. People ask me all the time do I regret getting the Band instead of Bypass and I truly can so NO WAY! I am so proud of the transformation that bariatric surgery has had on my life and the health benefits I have gained through this journey. Why Sleeve over Bypass? Because my doctors, Nutritionist, PA-C/Bariatric Coordinator, and Psychologist all sat down and talked about my health, my personality, my strengths, and my weaknesses, my success with the Band and my struggles with the band and my desire to never be a size 2 and that I really needed a slow journey once again. I know this sounds a little crazy but remember I have now have passed psych two times! It not about being a skinny girl for me, it’s all about being healthy and living life to its fullest. I just hit the two-month mark from my conversion and I am down 30 pounds. Feeling great and once again so grateful to Southern Surgical for believing in me and supporting e in this life long journey. August 6, 2017 makes ten years for me as a Bariatric patient. I never want to see 301 again! I’m overjoyed by this journey as I look back. 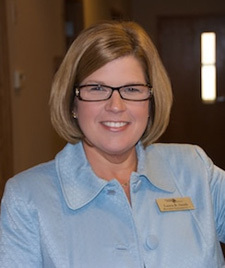 First that I was brave enough to recognize I needed help with my weight, second that I was blessed to go to work with Southern Surgical, and third that I understand that surgery is a tool that only I have control of. All journeys have a beginning, middle, and end. As I continue to learn, struggle, brush myself off and try again, I have been blessed by the support of thousands that I have had the pleasure of meeting through the years each week in class, clinic, and in the support groups. I do consider this the middle of my journey, the fight of my life to continue to control my food choices, the accountability of the scales each week, the frustration knowing exercise has to be a part of my lifestyle, and that I’m a healthier person because of the choices I make. No one knows their end and I am no different. I am blessed to enjoy life everyday and try to continue to better myself. I have learned so much from my journey and look forward to continuing to fight for myself, health, family, and future. No matter what life throws us, I believe it’s all about how we handle it. I am committed to first doing my best always, picking myself up when I fall, and always having time for others. Iron sharpens iron and I am here to help you in anyway. Thank you for reading and continuing to follow my journey. I’ve had bumps in the road, but it has been so worth it! 2007 it all began with the Lap-Band after finding myself at 301 pounds. Then in 2012 my body rejected the Lapband after losing over a 100 pounds. Fear overcomes you, weight gain occurs, and the fight begins with insurance for a conversion. Six months later, horrible reflux, some weight gain, and finally surgery is scheduled to remove the band and convert to the sleeve. Why the sleeve everybody asked, because I had no co morbidities, not a lot of extra weight to lose, and the doctor felt it was the perfect choice for me and my health. Conversion patients have less weight to lose because of the original surgery and weight loss is much slower than the original surgery. It is so overwhelming to have always battled with your weight, for most is affects their health, and some their lifestyle, career, marriage, and so on…we all have a story to tell. For me it has been my entire life struggle and my reality. To choose surgery was huge for me, to have a second surgery felt like failure. I now worked for Southern Surgical and I truly believe Bariatric Surgery changed my life, but so embarrassed that I had started to gain some weight back, and now have to have another surgery. Even though it was not my fault, or my plan, it is still part of my journey. I now have been a bariatric patient for eleven years total and five years out from Sleeve surgery! Three to five years out of surgery is the danger zone in the bariatric world and I am finding myself struggling. First time in my life that it is only 10 pounds I want to lose. Never have I had that as a goal. I have finally found my personal comfort zone with my weight and clothing size . It only took me being over ten years to figure it out. With help from my doctor I now understand it is ok not to be a twig and that I need to feel comfortable in my own skin. My goal is to keep my weight in the 165-175 range, not under or over, which for my body type has me in a healthy size 10 pants. Ten pounds equal a size change for most people and it really does for me. So my 10’s are tight! It’s time to refocus , get in with the nutritionist, and get 10 pounds off! This is the most incredible feeling and goal for me. Usually it’s a 100 or 75 pounds, so 10 pounds is not overwhelming, and for the first time I feel it is doable, it just has to be done! I am throwing out a challenge to our patients that are in the same situation as myself. The patients that have a few pounds they are battling and understand my struggle. Get in the game with me. Southern Surgical has always taught us that surgery is a tool, this is a life long journey, and together we will fight for a healthier lifestyle. GET TO A MONTHLY SUPPORT GROUP! Set your own life goal and let’s work together to stay in that place for a lifetime.